With the holidays now in full swing, local restaurants are enhancing their menus with specialty dishes, drinks and desserts that are designed to highlight the flavors of the season and showcase the talents of their chefs. Since opening a Marina del Rey location in July, SusieCakes Bakery has been offering home-style cupcakes, cookies, cakes and bars for those looking to satisfy their sweet tooth. The bakery offers a seasonal menu for the holidays through December. a variety of festive shapes, old- fashioned Gingerbread Men, Spiked Eggnog Cupcakes frosted with rum buttercream, Pumpkin Cheesecake and Pumpkin Bread Pudding. They’ll also have New Year’s sugar cookies and Champagne and Mimosa cupcakes available December 29 through the 31. SusieCakes Bakery Marina del Rey is located in the Marina Square Shopping Center at 4714 Lincoln Blvd. in Marina del Rey. Westchester’s Truxton’s American Bistro has delighted diners since opening its restaurant in 2006 with its take on reinventing classic dishes and its casual atmosphere. Truxton’s updates its menu every few months to include seasonal specials and favorites. For winter, the restaurant is offering a variety of new entrées and dessert specials. Kale and quinoa make appearances in the Cold Red Quinoa Bowl and the Chopped Kale and Red Quinoa Salad with Fuji apples, roasted pecans and fig jam. The hearty Mom’s Grilled Eggplant adds layers of charred broccoli, spinach and seared mushrooms to an otherwise traditional dish. up a homemade Pumpkin and Spice Cheesecake with a ginger snap crust, topped with fresh whipped cream and cranberry compote, the Salted Caramel Carnival Sundae, made with salted caramel gelato and cinnamon sugar churros filled with caramel, and a Flourless Chocolate Cake topped with salted caramel gelato, chocolate shavings and fresh whipped cream. Cafe del Rey is known for its beautiful location overlooking the Marina and its Executive Chef Chuck Abair’s decadent and delicious dishes. The Marina del Rey restaurant is now serving up holiday cocktails including Pear Fiore Prosecco made with Grey Goose Pear Vodka, St. Germaine and sparkling wine. Forever Young mixes Tito’s Handmade Vodka, a liqueur with acai extract, pomegranate juice, lemon and blueberries. Seasonal dinner options include a swordfish dish with squash and pumpkin seeds, a striped bass with potato, quinoa and vegetables dish and a duck breast with mash potatoes, braised red cabbage and pine nuts in a port reduction. For dessert, try the Mixed Berry Pie, a berry infused treat with brown sugar, sweet pastry crust and cinnamon ice, or the Sweet Potato Cheesecake with spiced yam puree and caramel. Cafe del Rey is located at 4451 Admiralty Way in Marina del Rey. Bacari PDR is Playa del Rey’s newest restaurant and it is offering its first seasonal small plates dishes this month. Executive Chef’s Lior Hillel holiday dishes include Mini Yam Cakes with mustard greens, winter root vegetable salad, and smoked pablano dressing, a Sourdough Tomato Soup served with Frantoia olive oil, smoked mozzarella grilled cheese and micro basil and a Bulgur Salad with eggplant, cherry tomato, scallion, cana de cabra cheese and sun dried tomato dressing. They will also be offering a specialty holiday cocktail, the S’mores Martini, made with vanilla vodka, chocolate liqueur, crème de cacao and cinnamon with a graham cracker rim and topped with a toasted marshmallow garnish. Bacari PDR is located at 6805 S. Vista Del Mar Lane in Playa del Rey. Playa del Rey’s Playa Provisions has tasty desserts on any given day thanks to pastry chef Kristin Feuer, but for the holidays the restaurant’s King Beach will be serving up specialty items for a limited time. Try their Wint-o-Mint Popsicle, a minted white chocolate fudgesicle dipped in white chocolate magic shell and decorated with tiny snowflakes, or their Christmas Breakfast Pie, a treat for the eyes and taste buds. The pie is made with eggnog ice cream, drizzled in banana-rum caramel and garnished with chocolate covered cornflake crunch and gold leaf. Feeling chilly? Try their Frozen Hot Chocolate made by pouring warm European drinking chocolate over peppermint stick ice cream and topped with a festive swirl of toasted marshmallow. As an added bonus, the drink is served with Christmas cookies perfect for dunking. Playa Provisions is located at 119 Culver Blvd. in Playa del Rey. 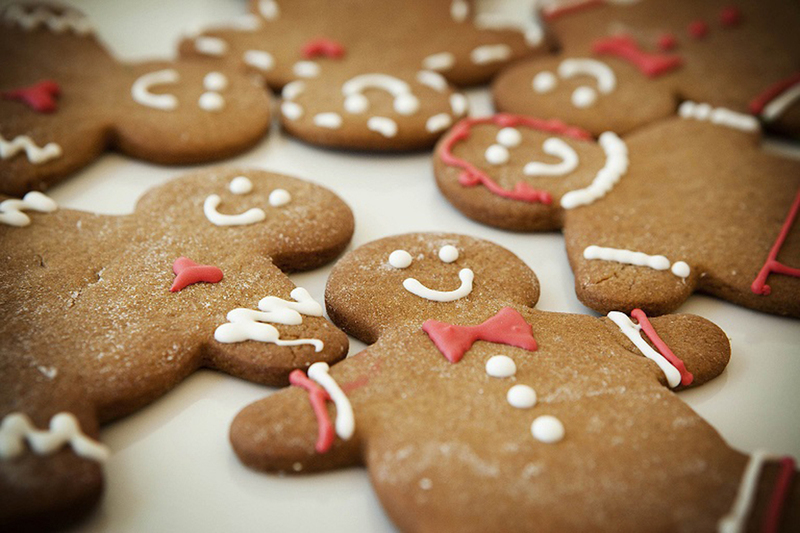 Photo: Old-fashioned Gingerbread cookies are available at SusieCakes. PHOTO COURTESY SUSIECAKES.